What is Pretending is Lying? Pretending is Lying is a fantastic memoir by Dominique Goblet. It was published by L’Association, the now-institutional independent French publishing house, in 2007. Thematically it jumps around a bit but to my mind it’s largely about relationships — between her and her father, her daughter, her lover and his relationship with his former lover. It also interrogates the relationship of truth and fiction and narrativity. Around 2011. I had moved to Montreal and the sudden availability of Francophone comics was amazing. I was devouring them. I’d go to a new friend’s house and see fifty different comic books I’d never seen in my life. 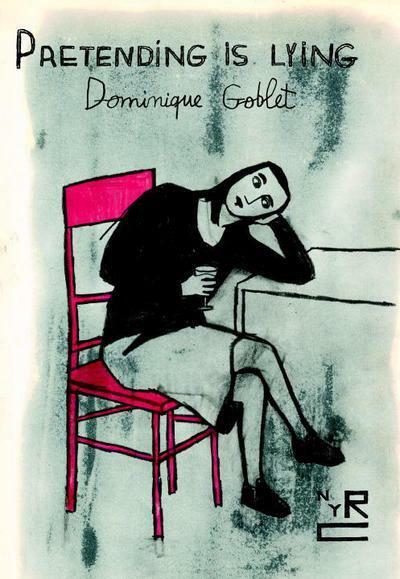 With Goblet, I was attracted to the drawings, and then Julie Delporte assured me it was good and lent me her copy of Faire semblant c’est mentir (Pretending is Lying). What was your experience of French comics before that? What did they offer you as a young cartoonist that you hadn’t necessarily found in North American comics? I think other than Tintin the first European comics I saw that really blew my mind were albums from Moebius’ Airtight Garage. When I was a teen I would go to Comic Relief (a comic “bookstore” in Berkeley where I later worked) and they had a small French language comics section, and that’s where I found Moebius. They were expensive but I bought a couple and would read through them just for the drawings, since I didn’t speak French at the time. When I was 20 I studied abroad in France and on a tip from Erika Moen I went to the 2008 Angoulême comics festival. I crashed on the floor of a student at the comics school there. It was amazing, I discovered the work of Manuel Fior. I had almost no spending money though and so I only bought one comic the whole festival, which was his first comic, Les gens le dimanche, and he made an amazing drawing in it for me. I got to see loads of interesting looking French comics, but I was only just learning French and couldn’t afford to take any of them home, so most of all it opened my eyes to the huge world of European publishing. After college I would order various French comics from Amazon France, but they were still expensive, and it wasn’t until I got to Montreal that I could just borrow anything I wanted. 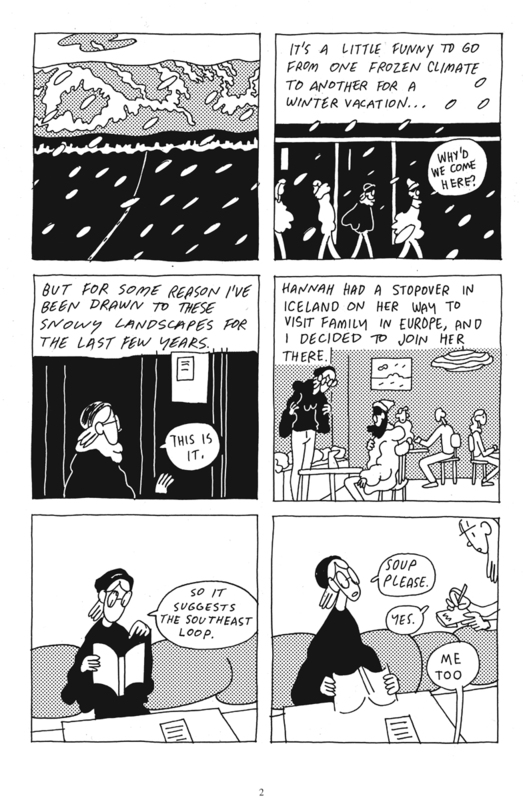 Aesthetically, I’m just really attracted to alternative European comics! The alt comics there often aren’t focused on heavy rendering. I really like their storytelling style. And comics has had at least a modicum more respect in Europe than in America (although it’s not the dreamland of respect that people think it is), so I think there is also a longer tradition of “comics for adults,” which just means there’s a huge unexplored library out there. I believe the Francophone comics market is the second largest in the world, following Japan? So there’s a lot out there. It’s not all good, but a lot of it is! How did you end up translating the Goblet book? 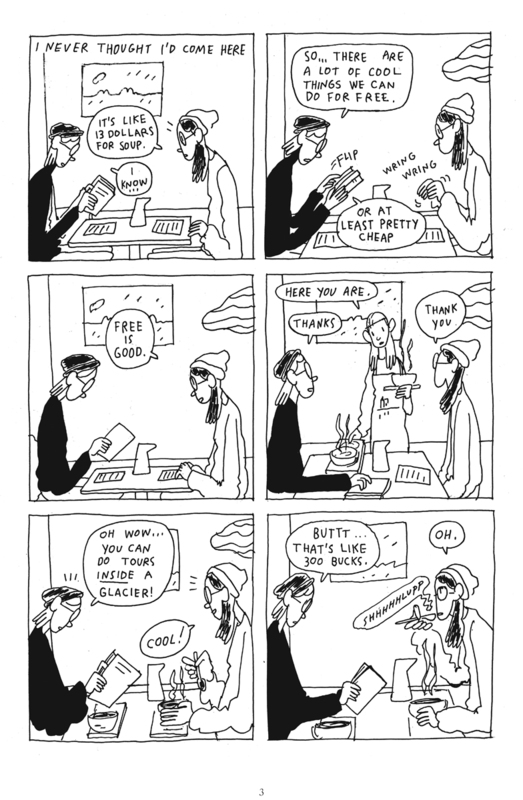 My friend and fellow cartoonist Lucas Adams had a part time position at NYRB, and he Gabriel Winslow-Yost decided to pitch a comics imprint to the publisher. He knew I was into European comics and that I was familiar with NYRB’s publishing arm and so he asked me for a list of books I thought were deserving of attention and would fit with a potential comics imprint there. Pretending is Lying was one of the books I suggested. The imprint idea worked (now known as NYRC), and they decided to publish the Goblet. I did a sample translation from the first chapter (and they solicited some other folks as well) and in the end they offered me the translation job. How did you approach translating the book? I only have the English language edition, but I’m curious what the language is like in French. At times the spoken language is colloquial and at times it’s quite literary. I think staying true to that is important. You can’t always just ask the question, “Would somebody even say that in English?” because first you have to ask, “Would somebody even say that in French?” If the answer is no, then I think you have to try to stay true to that. There’s authorial intent there; you can’t just try to make things “more natural” because “that’s not the way people speak.” Sometimes that’s hard to spot. Translation is like a puzzle, but there’s no way to get it 100% right. I’m always thinking about rhythm. Goblet’s book had a lot of idioms and you can’t just translate those directly. Well, you could. You could have direct translations and asterisks everywhere explaining what these things mean. A few times I did that in the Goblet book, because I do think the cultural context is very important, and she had done it in the original to explain Brussels dialect to Francophone readers. Sometimes it’s more important that the work flows. When I’m trying to translate something that doesn’t work directly, I’m thinking of rhythm and of where equivalent English idioms come from in terms of meaning, location, class, cultural background. If you make somebody say “Bless your heart” in the English version, it gets a feeling across, but you’ve also suddenly made them Southern. Do you want to do that? There’s this tradition in prose and poetry of creators who also translate. Lydia Davis, W.S. Merwin, Anne Carson, the list goes on. We don’t have that in comics and I wonder if the project has changed how you think about your own work or about comics more broadly. I love Anne Carson and she’s a little bit of an inspiration. I think it makes perfect sense that she’s an essayist, poet and translator. She clearly enjoys thinking about language. Through translation (and just through learning another language) I’ve learned so much about my first language. Goblet’s book isn’t the first translation I’ve done, so I’ve been thinking about this for a little while now. In my own work I think a lot about language and rhythm and poetry. Translating helps me pay attention to things like word repetition… when I’m editing my own stuff I read it out loud to myself, I sit there and circle single words and change them for rhythm or meaning. As far as translation, does the fact that this book is contemporary, that Goblet isn’t our age but she’s not that much older, does knowing and understanding that cultural context matter when you’re trying to translate a work? Sure, I do think that matters and the ideal situation would be to have someone who is familiar with that context. I had two Francophone cartoonist friends who had lived in Brussels for many years to help look over my translation with me, but I still had to look up and ask around about particular idioms and their meaning. But lucky for us, Goblet actually already explained a number of things in the original text (generally the places where there are asterisks) to Francophone readers who are unfamiliar with particularly Belgian things, so on the really hard stuff I didn’t have to dig too deep. Pretending is Lying is a book that really questions truth and fiction as you mention and as you’re working in nonfiction comics and tackling questions about what to present, how to depict it, is there anything here you were either translating and or drawing that made you think of other projects and how they were connected? I’m always thinking about those things when I’m working, so I don’t think this project brought up too much new for me, but it is nice to see a reminder that people are aware of the inevitable falsity in the recounting of any tale. Since War of Streets and Houses came out you’ve been making short journalistic comics for The Nib and elsewhere about covering the RNC, visiting Standing Rock. How did you get into doing that? 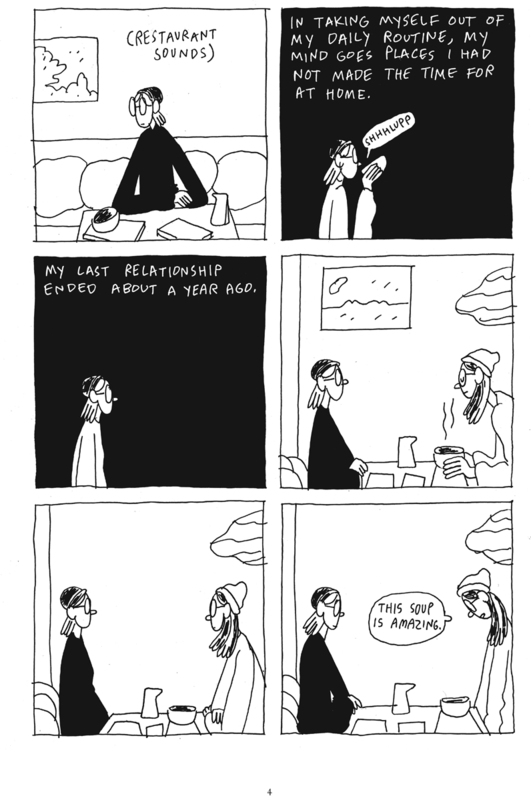 I have a couple powerhouse nonfiction comics friends, Susie Cagle and Sarah Glidden. 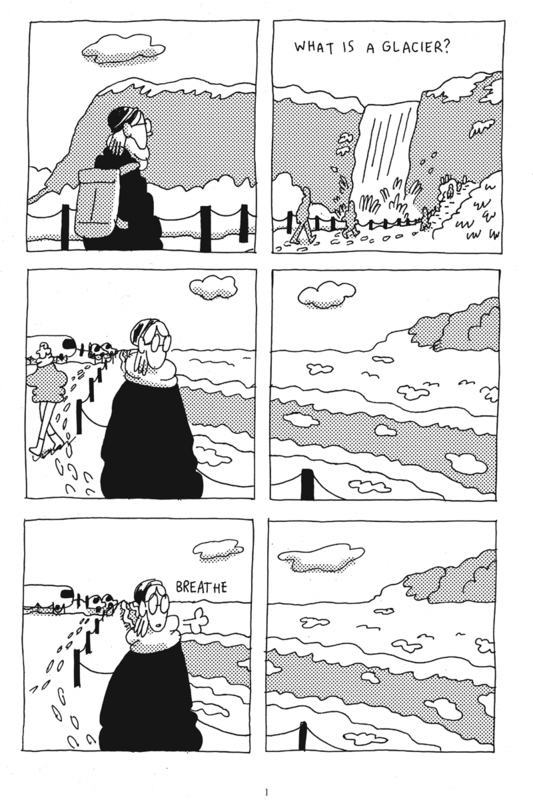 Susie is an amazing comics journalist who really encouraged me over many years to do some comics journalism. Sarah is particularly interested in questions about journalistic practice (as her latest book Rolling Blackouts makes clear). We’ve had a lot of great conversations about journalistic ethics and practices, and we share resources pretty regularly. Many conversations with both of them gave me the confidence to start pitching. My first piece was for The Nib and it was about HIV criminalization, which was a very hefty topic to start with because it required both medical and legal research. Since then I’ve enjoyed doing on-the-ground reporting (a different skill altogether) with a quick turnaround. The folks at The Guardian and The Nib have put their faith in me on a number of occasions now and I’m very grateful for that. Nonfiction comics and comics journalism have become much bigger and more prominent in recent years. How do you describe what you do and what do you hope to see more of or do going forward? I guess more and more I don’t have to describe it as much. It still seems to be a pretty small number of cartoonists but it’s expanding quickly! Also more and more different outlets are paying for nonfiction comics. I’d like to see more of that! I think it will happen, because the internet has opened up a way for full color comics to be read without incurring expensive printing fees, and I think readers like them. I think it’s also another way that more people will become comics readers, and maybe if they’ve read free nonfiction online they’ll be more likely to try out a book! Also right now you have a new book What is a Glacier out from Retrofit. What is this book? It’s not a full length book, it’s a 28 page story. It’s more personal than my journalism, more along the lines of War of Streets and Houses. It’s largely about climate change and grief around that, but it also touches on things like a big breakup I went through a couple years ago, and anxiety around not having status while living in abroad. It’s one story and it weaves around a bit, and hopefully folks will enjoy that and not be too confused by it. I know you’re at CCS right now. How have you found teaching and how have you found Vermont? I really like teaching. My favorite part is workshopping. I like sitting down with someone and talking about something they care about and trying to help them make it the best that they can and to achieve the goals they’ve set. Being at CCS is great because the students who come take it very seriously. They might be at different places in their “comics careers” but the camaraderie is palpable. This makes for what is generally a pretty dreamy classroom environment. The faculty work very closely together and so I get to work with amazing, legendary cartoonists (and some less legendary but just as amazing peers) all the time. As for Vermont, it’s a great environment for buckling down and getting work done. The summer here is magical (swimming holes!) and I’ve also been doing some new Vermont-y things lately (I started mountain biking in the fall which is really fun). Politically, I like it a lot. I don’t know if it’s my forever-home, but for now it’s pretty good. This is sort of a larger picture question but what do you want to do next or where is your head space right now? Longer vs shorter? Memoir vs fiction vs journalism? Pencil vs Computer? I’ve got a bigger memoir-esque book that I’m working on right now. It seems to be in pencil. It’s kind of a story of becoming, an origin story about becoming politicized. I’ve been working on it for a long time and it’s finally fully thumbnailed, and I’m editing and drawing parts of it. I haven’t figured out where I’ll publish it yet. I’ve entered into a “Season of No,” which is where I try to say no to opportunities that conflict with my ability to work on the project. It’s hard! There are so, so many topics I’d like to do shorter nonfiction pieces about. I try to remember that even the smallest illustration gig pulls me out of it while I’m at this stage. I have to be very careful with my attention, it’s much more volatile than I’d like. The task now is to clear enough of a path for myself that I can get into the flow of this project. Honestly, it’s a story I’ve been wanting to draw for way too long. Time to get it done. 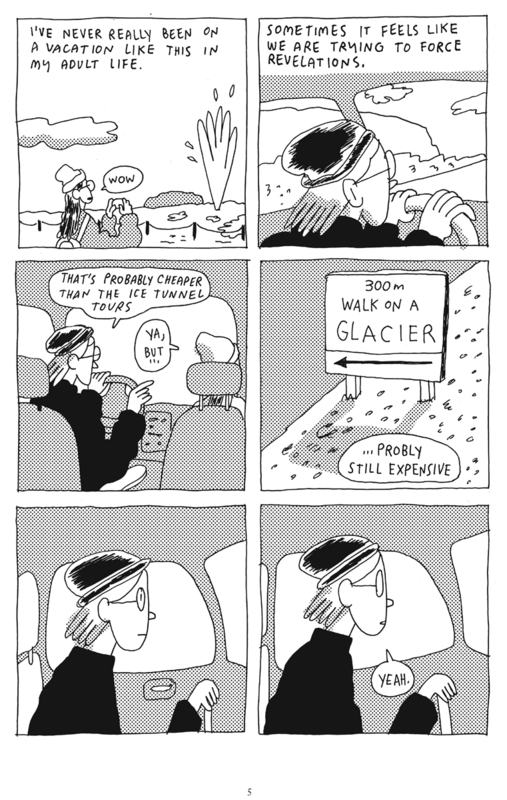 Below: Pages from What is a Glacier? 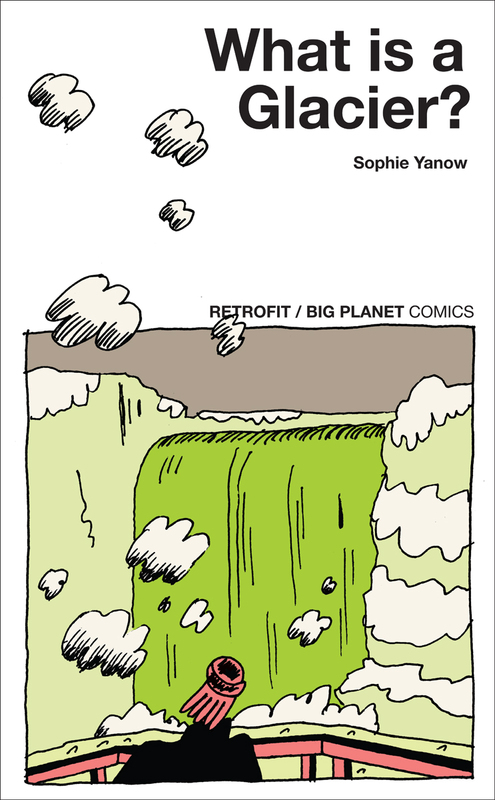 Author Alex DuebenPosted on July 5, 2017 July 4, 2017 Categories InterviewsTags Center for Cartoon Studies, graphic novels, Pretending is Lying, Retrofit/Big Planet, Sophie Yanow, The New York Review of Comics, What is a Glacier?